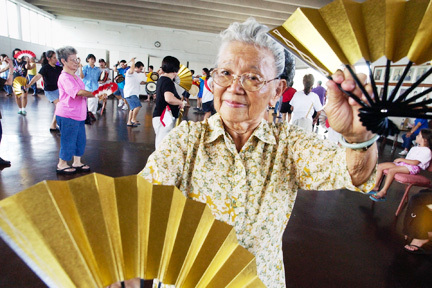 Dancers at the Jikoen Hongwanji Mission in Kalihi, including 88-year-old Agnes Kameko Higa, practice for the upcoming bon dance festival season. Starting next week, colorful lanterns will light the way, and reverberating drumbeats will usher in three months of the Buddhist celebration honoring the dead. Why is the obon season so long, with weekly festivals of dance and music held from June through August? There are so many bon dance clubs in Hawaii that they have to take turns every weekend at the various temples and mission houses. There are many versions of how the Japanese bon dance tradition started. Agnes Kameko Higa, 88, an Okinawan-style bon dance teacher for more than 50 years in Hawaii, said the bon dance is based on a tale of a "boy looking for his mother." The boy's mother died when he was very young, and when his father remarried, the little boy was unhappy and wondered where his mother was. He left home "looking for his mother's grave. He sees an old man on the side of the road and asks him for help. "He told the boy: On the evening of the seventh day of the seventh month until the 13th, you will see a glimpse of your mother under your sleeve," Higa said, lifting her arm in an oft-repeated motion in bon dancing. So from July 7 to 13, the Japanese go to clean the grave sites and "make everything in the house spick and span, put fruit on the altar, to make it ready for their ancestors to come home to visit," she said. On the 13th these spirits leave their graves to visit their families, and return to them on the 15th, Higa added. » The Waialua Hongwanji Mission will hold its bon dance at 7:30 p.m. Aug. 6, not July 23 as printed Saturday in a schedule on Page D6. 1727 Pali Highway June 20, 21 and 22, 7:30 p.m.
45-520 Keaahala Road June 29, 7 p.m.
902 University Ave. June 13 ,20, 7 p.m.; June 28-29, 7:30 p.m.
1223 B N. School St. July 6, 7 p.m.
66-469 Paalaa Road July 5, 7 p.m.
30-D Maluniu St. July 14, 7 p.m.
1731 N. School St. July 20, 22 and 27, 7 p.m.
1641 Palolo Ave. July 27, 7:30 p.m.
164 California Ave. July 27, 7 p.m.
915 Sheridan St. Aug. 9, 7 p.m.
95-257 Kaloapau St. July 28, Aug. 4, 11, 15, 16, 17, 7 p.m.
* The bon dance will feature Yamada Dance Group, Aiea Taiheiji Yagura Gumi and Hawaii Eisa Shinyukai.